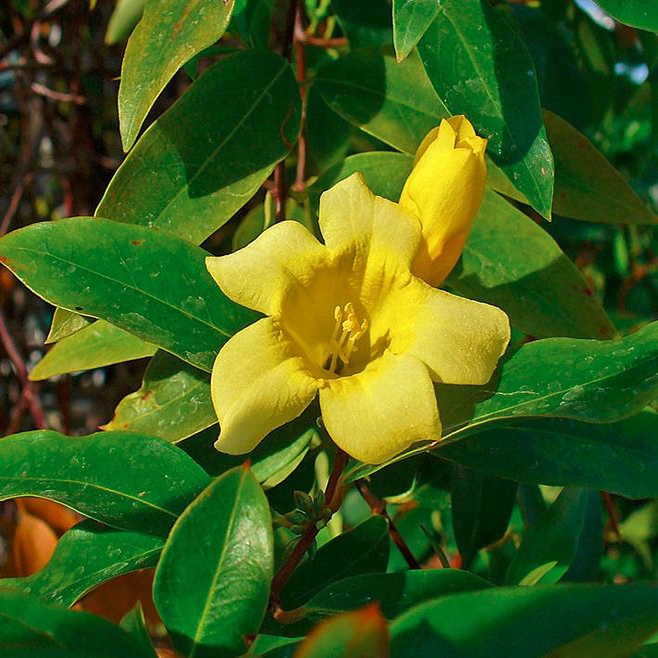 Carolina jasmine (Gelsemium sempervirens is a climbing, woody evergreen vine with fragrant, bright yellow flowers. It grows commonly in the bluffs and swamps throughout the Southeastern and southwestern United States, Mexico and parts of Central America. It is found most frequently growing along fencelines, open woods and roadsides. Carolina jasmine produces small clusters of fragrant yellow, showy trumpet-shaped flowers late winter to early spring. The Carolina jessamine is the state flower of South Carolina. All parts of carolina jasmine contains toxic strychnine-related alkaloids gelsemine, gelseminine and sempervirine. Following ingestion of carolina jasmine, horses often may develop neurological signs characterized by marked progressive weakness and convulsions culminating in death. NC State Extension Gelsemium sempervirens Toxic Plants. 2018. Craig, F. R.; Williamson, H. Poultry sickness traced to yellow jessamine. North Carolina Res Farming, 22(1), 3 . 1963.